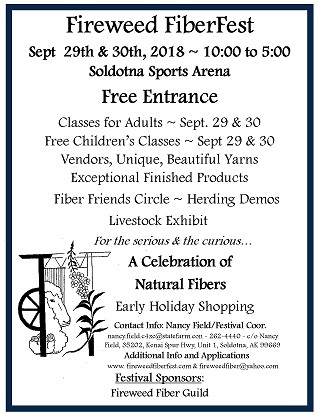 Due to transitions in the structure of the Fireweed Fiber Guild, this year's FiberFest will be cancelled. We are sorry for any inconvenience this may cause, and hope to see everyone in 2018. There are still about 14 openings for the Valley Weavers & Spinning retreat the last weekend of this month. Alaskan Fiber Arts Retreat. Please email [email protected] for details. Prices vary. Please remember that this is a drug- and alcohol-free (& kid- and pet-free) venue. Take a break, and treat yourself to a weekend in fiber-love! Please visit the Valley Fiber Arts Guild Facebook page for more information.